A delightful place in which a taste for tradition and the most innovative services blend together perfectly. A true work of art that boasts two centuries of history and preserves all of its ancient charm, enriched by the most modern comforts: staying here is like going on a journey back in time. The Hotel complex is in an elegant, luxurious setting, surrounded by a splendid centuries-old private park that offers to the Hotel’s guests some magnificent scenery. In the past, guests like the famous composer, Giacomo Puccini, have stayed at our 4-Star Superior Hotel in Versilia. The Hotel is just 50 meters from the beach and consists of four separate splendid buildings, situated inside the park: La Villa, La Torre, La Fattoria and La Duse. For your relaxation and well-being, the Park Hotel Villa Ariston offers: outdoor swimming pool, partner Beach Club, wellness room, gym, tennis courts and new playground for children. Guests of our Hotel will be delighted to wake up to a rich buffet breakfast and enjoy every day in our restaurants the best Tuscan specialities accompanied by a fine selection of wines. A large car park is also available and bicycles, which can be hired at Reception, are a great way to explore the area. Villa Ariston is easy to reach, thanks to its strategic position: the Versilia exit from the A12 motorway is 5 km away, while Pisa and Lucca can be reached by car in 20 minutes. 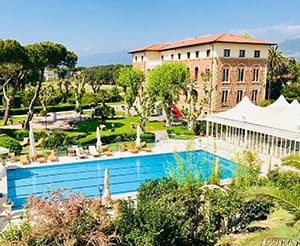 Park Hotel Villa Ariston: unique and unmistakable style for unforgettable holidays in a prestigious 4-Star hotel in Versilia. In the heart of Versilia, Park Hotel Villa Ariston is surrounded by greenery and a centuries-old park, combined with refinement and elegance. 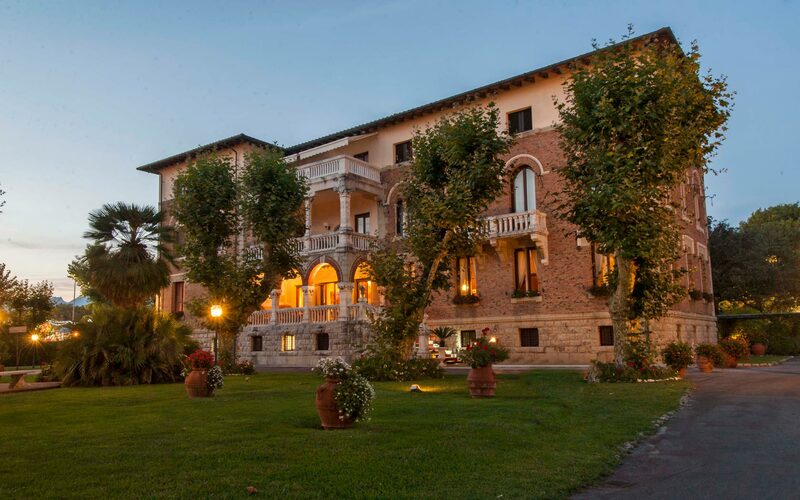 Park Hotel Villa Ariston is surrounded by a large centuries-old park, a true oasis of tranquillity. Flavours and aromas of the sea for even the most refined palates. Beach, sun, sea and lots of fun! At the Park Hotel Villa Ariston there are numerous opportunities for tasting the chef’s specialities. Our buildings are highly sought-after for organizing wedding banquets, christenings, holy communions, receptions, fashion shows and many other events. The hotel offers availability of the magnificent multi-functional complex and the whole of the lush park, which can accommodate up to 250 guests. Park Hotel Villa Ariston is located right next to the sea. 22,000 sqm of parkland and an equipped garden. The hotel offers pathways accessible to disabled people and special rooms. Private beach facilities are located a short walk from the hotel. FREE Wi-Fi service in every area of the hotel. Large car park inside the park and an underground garage.